In an ideal world, the stiffness should not vary at all and the data above would be a perfectly straight line across the graph. In practice this is not the case and we see a slight increase in the stiffness from around 650 to around 700 over the range of inertia tested. This is likely due to two principal causes. First, since I do not include the inertial mass of the tripod itself in my calculations, I am likely systematically underestimating the real inertial mass. I do this because most of the tripod’s mass is centered near the apex, and will thus contribute a very small amount to the inertia compared to the bar and the weights. Second, the stiffness of the system likely increases as the amplitude of the oscillation increases, representing some nonlinear behavior. This is not shocking, as no real world system conforms exactly to linear models. Overall though, this represents excellent consistency. Anyone repeating this test should end up with numbers for the stiffness no more 5% different than mine. It is this stiffness test that will form the core of the quantitative portion of my tripod evaluation. There is a lesson to be learned as well for the testing scheme. In order to minimize errors due to the calculation of total inertial mass of the tripod-bar-weight system, the weights should be placed as far out from the center as possible. This minimizes the approximation error of treating each weight as a mass at a single point and maximizes the total inertia, allowing us to treat the tripod’s inertia as negligible. This is a completely different story. 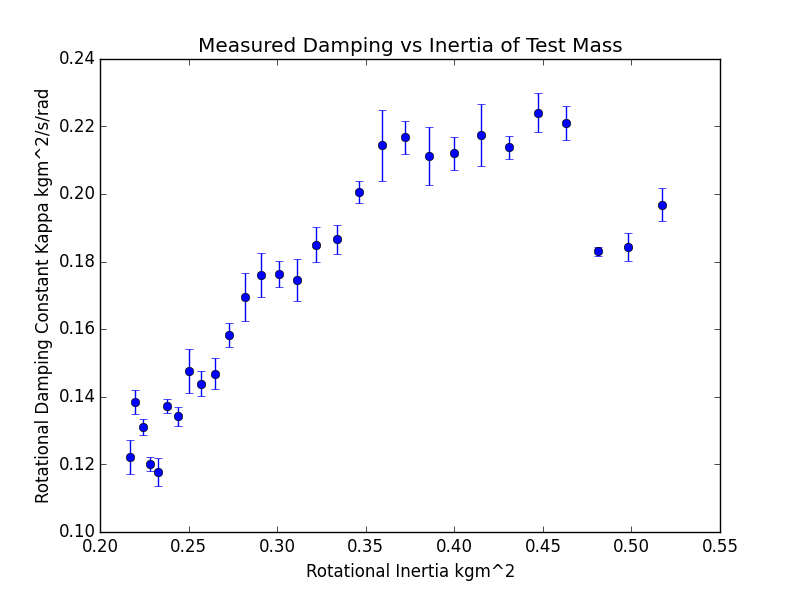 The measured damping changes by nearly a factor of two over the range of test inertias. This cannot be explained by the approximations made in the inertia calculation. The damping is non-linear with smaller oscillations damped at a slower rate than larger ones. We should thus not expect total consistency between tests. Factors such as the inertial mass, magnitude of the initial push on the tripod, and range over which the curve fitting was done to all affect the damping rate. This inconsistency is also reflected in the much larger error bars on this test. The curve fitting is particularly difficult. Fitting an exponential as required for the damping test is much more difficult than fitting the frequency of oscillation. I will report the damping in my results, but with a huge grain of salt. It will only be useful to discern gross differences between tripods. 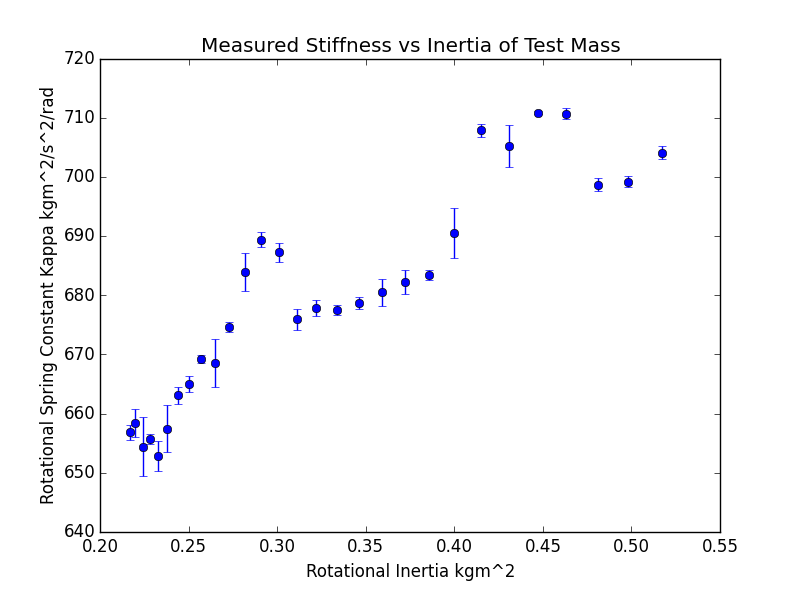 Here is the data for stiffness vs inertia but plotted to be more visible. The error bars are more visible here. 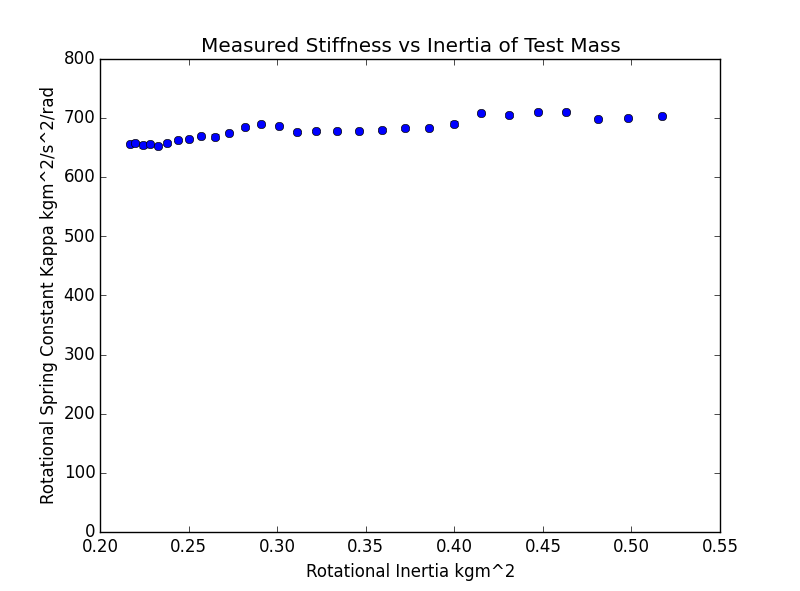 There is a clear upward trend in stiffness vs inertia. The small group of three and then subsequent group of four are clear outliers. I’m not sure if something shifted, and then shifted back, while I was testing. I’m sure more investigation would reveal the cause, but it doesn’t really affect my overall conclusions, and so its not worth the time right now.